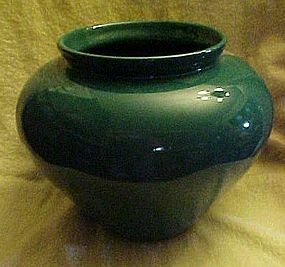 Nice Haeger centerpiece vase in a dark pik color. Heavy, and quality made with the Original Haeger Floral sticker on the bottom. 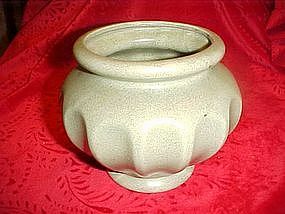 Measures 10" diameter and 3" tall. Opening at the top is 3 3/4". Pristine condition. BEAUTIFUL HUGE HAEGER ART POTTERY POT OR VASE. This is A Beautiful HUGE HAEGAR ART POTTERY POT OR VASE. 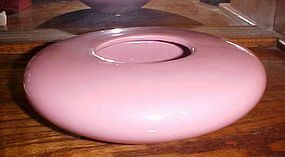 It measures approximately 8 1/2 inches tall, 6 1/4 inches in diameter at the top, and 10 inches wide. It is marked Haeger American Made #4328 and dated 1990. Does not appear to have been used much, if at all. It is in Perfect condition with no chips, cracks or repairs. Original paper sticker on the bottom. This would be a Wonderful addition to any collection. Nice color and shape. 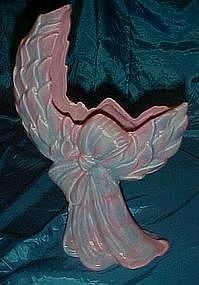 Stunning Royal Haeger by Royal Hickman R-303 mauve agate Laurel Wreath Bow vase is 12" tall x 7 3/4" long. It has the Royal Haeger by Royal Hickman mark on the base, (faint but visible)Beautiful condition other than a very small glaze chip on the underside of the bow. 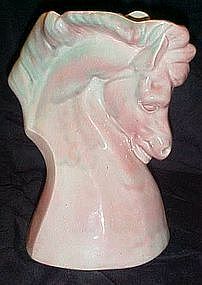 Beautiful vase, and hard to find without any flaws. 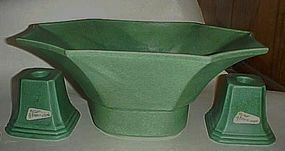 Nice size green speckled vase designed exclusivley by Haeger, for Florists Telegraph Delivery (FTD) Association. This stamp is on the bottom of the vase. Haeger USA. Measures 5" tall and is in fantastic condition with no damages. 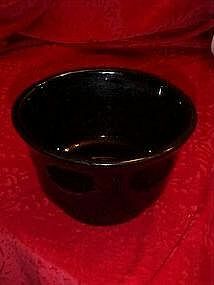 Shiny black glaze on this smaller size mixing bowl, marked Haegar USA. I can't make out the number because the mark is filled with glaze. Measures 4" tall and is 6 1/8" in diameter.Straw mark on the bottom side that I thought was a crack, but is filled with glaze also. Great condition.